Here is the latest Australian Mining Workforce Planning Environmental Scan updated to the end of October 2012. Figure 1: Australian Mining Workforce Planning Environmental Scan 2012 (Jan-Oct). Data sourced from Australian Mining Newsletter & News Archive. Some stories have been verified against primary resources (i.e. ASX, commercial websites and other news agencies). In the words of Tony Abbot, this will be more of a python squeeze than a cobra strike. I’m not talking about carbon tax though but a slow reversal in mining employment over recent months. The most prominent Workforce Planning story and issue for October was employment. This is now the fourth month where employment stories have dominated and as the data shows, it’s been mainly negative. In the month of October there were 17 unique negative employment stories with 1,294 jobs lost and only one positive story with an employment gain of 300. Oct: 35.8% (83.3% negative, 16.7% positive). The trend over the past four months has been of an industry looking to cut costs and delay operations. Since July there have been 3,597 new jobs gained against 7,196 lost. So for every job created there are at least two that now no longer exist. Given that the Australian industry data will be updated by the ABS for the Sep – Nov period shortly I can confidently predict that there will be a drop in quarterly mining employment for the first time since May-Jul 2009. What I can’t predict will be how large the drop in employment will be. If the general news media is detailing an approximate 3,500 loss then the actual numbers may be around twice that (comparable to the losses in the first two quarters of 2009). 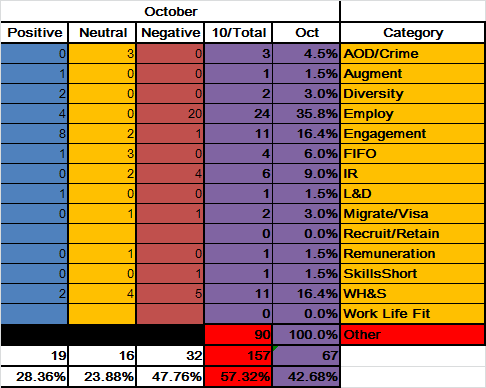 Also of note for October was a high concentration of positive Engagement stories, represented by the maroon data line (making up 16.4% of all Workforce Planning stories with 72.7% of those positive). This came about because of a number of industry conferences promoting mining and two CFMEU campaigns, including the advocacy for sustainable mining and employment in the Tarkine region of Tasmania. Table 1: Data for Australian Mining Workforce Planning Environmental Scan Oct 2012. Data sourced from Australian Mining Newsletter & News Archive. Some stories have been verified against primary resources (i.e. ASX, commercial websites and other news agencies). Also coming in at 16.4% was Work Health & Safety (WH&S) although there was a greater balance between negative stories (which reflected near-misses, injuries or death) against neutral or positive articles. Included in this months WH&S data is the tragic story of Warren Black, killed in a worksite accident in Rutherford, NSW. WH&S stories have now averaged 22.9% for the first 10-months of 2012 and the lower October figure is more a reflection of the negative employment environment dominating the headlines. On that note, I’ll leave you with my pick of the October stories, which is a bit dark and somewhat of a mystery at sea. The coal ship Sage Sagittarius docked in Newcastle, Australia in the past week with its recently boarded safety inspector deceased, the third such death on the ship since mid-September!